Tomorrow’s 4th Annual Ventura County Wine Trail Celebration showcases the best local wineries as well as fine restaurants and local attractions and includes tastings of great artisan wines, delectable appetizers, and live music. It’s also a launch for the latest edition of the Ventura County Wine Trail map which lists 17 wineries, but I couldn’t tell you which ones will be pouring except Herzog which publishes the map, did the facebook event page, and sent me a message telling me to visit them at Table #30. * Denotes some of my favorites. 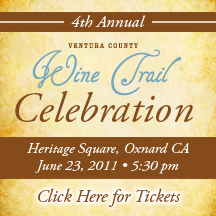 Held at the historic Heritage Square in downtown Oxnard, CA from 5:30 to 8:00 pm, June 23rd, 2011, the Ventura County Wine Trail Celebration costs $35 for those 21 and over and tickets are available online. A portion of the proceeds will be donated to the Ventura County FOOD SHARE, a food bank that houses and distributes millions of pounds of food every year to the hungry of Ventura County. So come on out, celebrate summer (maybe with some sunshine! ), check out the new wine trail guide, taste some wines and appetizers and know that a portion of your hard-earned money is going to benefit FoodShare! Hi gwendolyn, right up my alley. winemaker bicyclist, future burningman goer, adventurist. loved the bicycle wine box! Looking forward to being a future blogger. Recently visited Ashland to find new wineries establishing themselves. Bella Fiore being one of them. Hope the wine they produce matches the grandeur of their estate. Great! Blogging can be lots of fun! I wish you the best on your blogging adventure! PS Remember next year’s Wine Bloggers Conference will be in Santa Barbara! Registration is open now!